One of the top choices among professional anglers, the Shimano Sustain FE Spinning Reel has a reputation for durability and toughness few other reels can match. However, the addition of the all-new Paladin and Propulsion systems takes this distinction to new heights. The combination of metals in the drive system and advanced line management features will bring a noticeable improvement in your fishing. Smoother and more powerful than ever, with the features top anglers need: lightweight aluminum frame; aluminum spool with titanium lip; Aero Wrap II; machined-aluminum direct drive handle; exclusive SR-Concept design; Fluidrive II; Dyna-Balance; Floating Shaft; Super Stopper II; waterproof drag; maintenance port. Includes a FREE spare aluminum spool with titanium lip. 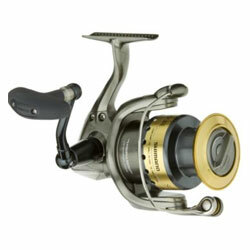 "I purchased this reel to replace a Daiwa I had for several years and it is outstanding. I used it last week on a bass tournament and it was so smooth and balanced I fished more with it than I did with my baitcasters. All my reels both baitcasting and spinning are now Shimano." ""I buy a new spinning combo every year and usually go with a Stradic with an Extreme rod to match, (have 4 of em) This year I figured I'd try the Sustain instead. It's certainly a better quality reel than the Stradic!" "I was actually going to purchase the Stratic, which I still think is an awesome reel, but as soon as I asked the BPS employee "what about the Sustain?"